The approval rate in September for an Israeli permit to leave Gaza for treatment abroad for those injured in the Great March of Return protests near the border fence with Israel was significantly lower than the overall approval rate. 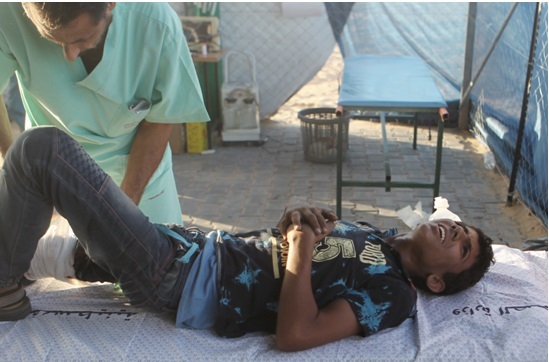 Of the 18 wounded Gazans, only one was approved; one applicant’s request was denied; and the applications of the remaining 16 were delayed and are still pending. Or, in other words, only 5.5% of these applications were approved compared to 58% of the overall applications which were Okayed. These statistics are based on the latest monthly report issued by the World Health Organization (WHO) on health access for Palestinian patients in the occupied territories. In its report for September published on Wednesday, October 31, the WHO indicated that overall, for that month, of the 1,837 Gazans who applied to cross the Beit Hanoun/Erez crossing between Gaza and Israel for medical reasons 1,074 (555 males and 519 females) were approved, or 58%. Of the permits issued by Israel during September for Gazan patients to leave the besieged enclave through Israel for medical treatment in East Jerusalem or West Bank hospitals, over a third (37%) were for children under the age of 18 while about a fifth (22%) were for elderly people over 60 years of age. The report said that 95 patient applications (66 male; 29 female), or about 5% of the total, were denied permission to cross Erez for health care in September. Those denied included 7 children under the age of 18 years and 14 patients aged 60 years or older.